Since becoming a horror icon with his role in the Evil Dead trilogy, Bruce Campbell has appeared in dozens of films and television shows, written two books, and made countless appearances at conventions, midnight screenings, and myriad other places where people shout “Hail to the king, baby!” at him. And as he’s traversed the world of conventions, he’s realized that maybe a movie with himself and all the other horror icons he knows from these shindigs might be a fun time. 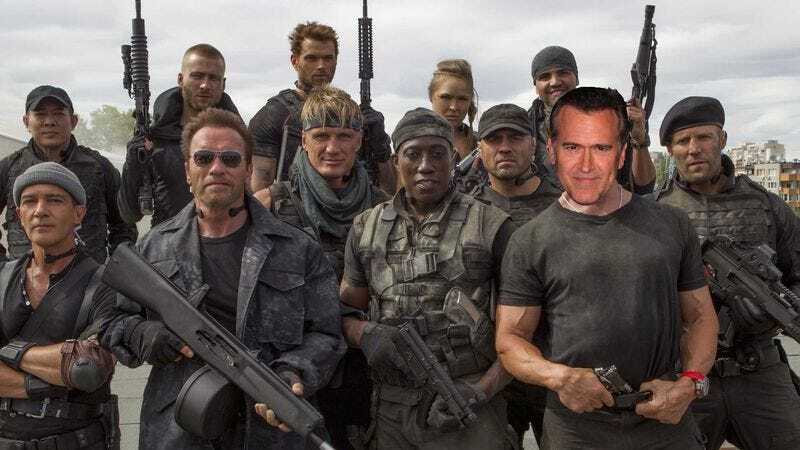 Dread Central reports that Campbell is very much down to shoot the horror movie version of The Expendables. Dread Central posits that this would be the rumored Bruce Vs. Frankenstein, a sequel to his horror spoof My Name Is Bruce. Of course, all of this suggests that Campbell hasn’t seen the third Expendables film, which is already a total horror show.